Seriously, Apple, did you have to make your operating system so non-intuitive for people from the 1940s? The Mac OS’ Extensions conflict is no match for the Wrath of God. This system failure courtesy of DC 2000 #1 (2000) by Tom Peyer, Val Semeiks, and Prentis Rollins. Maybe Courtney Whitmore should change her superhero name from “Stargirl” to “Fangirl“, given her reading habits. Who says that comic books and manga don’t teach you anything? This otaku moment has been brought to you by Justice Society of America #27 (July 2009) by Jerry Ordway and Bob Wiacek. While attempting to determine for himself the connection between an attack by the superpowered terrorist Scythe on the city of Monument Point and a World War II black ops raid on a Nazi laboratory in Libya that both he and the Golden Age Green Lantern were involved in, the Golden Age Flash asks the annoyingly cryptic (and incredibly decrepit) Senator Eagin a very pertinent question. Congratulations, Senator. You’re an utter failure in TWO languages. No, actually. No it’s not. First of all, Senator Eagin presumably meant to say “Scythe is the English word for ‘Drachen’.” since the way he’s phrased his sentence here implies that “scythe” is a German word and “drachen” an English one when the exact opposite is true. Second, “Drachen” has several possible translations. It’s the plural of “dragon”. It’s the proper German word for “kite” or “hang glider”. It’s a condescending slang term for a woman. But it sure as hell doesn’t mean “scythe”. The correct translation of that would be “Sense” (pronounced “sen-seh”). 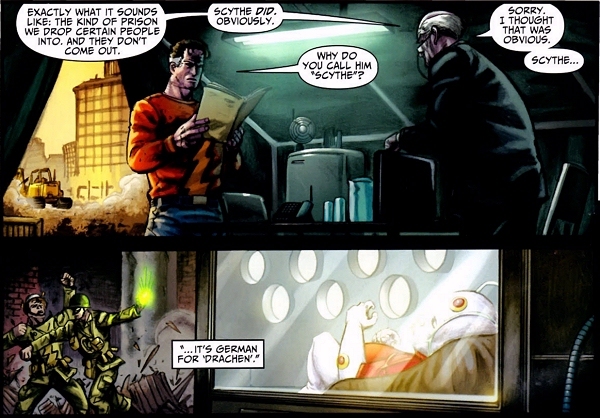 On an unrelated note, I’m not normally this harsh on a new creative team – Justice Society of America #44 (January 2011) is only the second issue in Mark Guggenheim and Scott Kollins’ run on this title, after all – but their German language failure is matched only by their character interpretation failure. Turning the JSA, of all teams, grim and gritty? Twisting the normally level-headed, likable Jay Garrick into someone all too willing to consider murdering a child and a criminal? Seemingly suggesting that conscience and morality are weaknesses and that the state is infallible and should always be obeyed? Absolutely pathetic, people. Absolutely pathetic.